Posted 10 May 2013 in General. 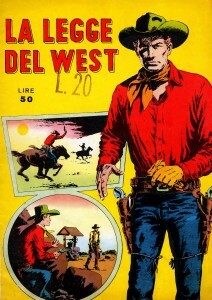 In late September 2012, Luca Dolcini sent the Kirby Museum an e-mail query regarding a 25-page Kirby western story he found in an Italian comicbook called “La Legge Del West.” Luca and his fellows on the Blue-Area of the Moon Marvel Continuity Resource could not find an original American printing. Sending along some snapshots of the pages, “Partitia Finale A Snake River!” looked like Kirby’s work, but the job number O-253 in the first panel, while matching the style of Goodman/Lee/Atlas’ numbering, was unknown to both Greg Gatlin’s AtlasTales.com and the Grand Comics Database’s Comics.org. GCD lists O-254 on a story with a publication date of August 1958. Luca mentioned that the main character was the “Silver Kid”, but none of the Silver Kid comics on Comics.org provided any obvious linkage to this story. Was it an unused “Black Rider” story? Responding to my query on the Timely-Atlas discussion group, Michael Vassallo identified George Klein as the inker since the telltale Klein corona is evident in some backgrounds. Michael also pointed out that according to its US publication history, the Goodman/Lee office did not publish any stories 25 pages long until 1961’s Fantastic Four #1 (which some index as two stories of 13 and 12 pages). It’s interesting that Klein is attached to both of these stories. After a while, Luca found an Australian version of the non-Kirby cover with the title “Showdown At Snake River!” in James Zanotto’s AusReprints.com database. Kevin Patrick of the blog Comics Down Under, responded to a query that, as luck would have it, the Rare Books Collection at Monash University Library in Melbourne, Australia, where he studies, had a copy of Horwitz Publications’ “Showdown At Snake River!” and sent scans. The story, a perfectly good one, doesn’t contain any splash pages. The title is only in the top third tier of the first page, and there aren’t any chapters. Could “Showdown…” have been produced for the foreign market? Considering the relatively recent discovery of Kirby’s ghost work on the Davy Crockett, Frontiersman daily strip being printed in comic book form in the UK and France, the story’s lack of splashes and—other than the title tier—all pages having only six panels, could it be a re-worked comic strip? Kirby Collector editor/publisher (and Kirby Museum Trustee) John Morrow pointed out that some of the panel sizes are irregular—which is not something that Kirby would do in that era—so perhaps some cutting and pasting was done. In his last e-mail, Luca wrote that “La Legge Del West” was published in July 1959. He also found the story printed in strip form, with two panels per page, published in 1962 in Collana della Prateria #6—Pericolo!. 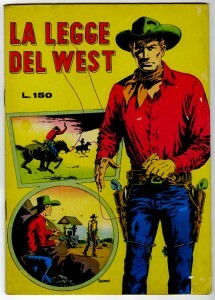 There was a second “La Legge Del West” comicbook with the same cover artwork, only this time including the signature of John Severin, published in the early 1970s, but it did not contain “Partita…” If anyone can date the Horwitz “Showdown…”, or find the origin of the Severin cover art, or have any other information to share regarding this fascinating discovery, please post here, or contact me at the Kirby Museum. It’s wonderful to see Jack’s stuff…!! I sure wished that Marvel would Reprint … all of Jack’s Western stories in a TPB form.!! A campaign should be underway to get Marvel to reprint ALL of the Western Stories… the Dr. Droom stories… and … I would like to see all of the Yellow Claw stories reprinted. 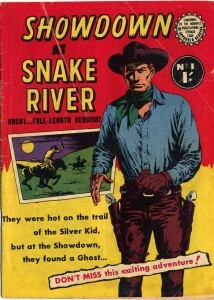 Can’t more be done to encourage Marvel to reprint stories like “Showdown at Snake River” … and ALL of the other western stories Jack has done.!!?? Can’t MORE BE DONE to see these stories reprinted.?? ?